Tuesday I start a new course in CFQ Qigong. (I’m mindful of how difficult it is to type a “Q” without adding a “u” after it). Back in 2000-2001, I took a Mindfulness-Based Stress Reduction course, affectionately called BMAP (Body-Mind Awareness Program) from someone who has become a great friend to me. Actually, my current circle of influence is still speckled with souls from this group. During this program, I was introduced to Qigong and I remember it being an extremely relaxing, healing form of movement that seemed effortless yet effective. I’ll be exploring Qigong with Dana Marcon of DM Personal Training, who was my fitness instructor back in the 90’s at my company’s gym….funny how time evolves us. Level 1 focuses on the meridians and level 2 on the mind. Through the course, I will become certified to teach Qigong and I’m already envisioning my application, although open to all possibilities. I haven’t started yet, remember. Anyway, my goal is to record my journey through my blog, so if this bores you, tune out…but wait, don’t really, cause, you know me: I’ll probably forget to update and jump into another topic of interest, like my kids or how much I miss my boyfriend. Oh, and I just finished a two week “Fat Flush Program” (Anne Louise Gittleman) and lost 12 pounds, but it’s creeping back now that I’ve allowed some gooey good food in my mouth. The best thing about the fat flush is that you can always start again. So, tonight it’s a long-life cocktail (get the book) and some fishoil (by Ascenta Health…an innovative Nova Scotia company). Tomorrow I’ll start with the hot water and lemon to cut through the KFC and DQ ice-cream I devoured tonight. As I type this, I can actually feel the acid reflux symptoms again and can’t believe I lived that way for so long. It is true, whole real food makes you feel whole. Are you like me? For years I would experience excruciating pain in my chest, become light-headed, anxious and my mind would not be clear about anything. I would wonder if other people ever felt like that or if it was considered somewhat normal. I can’t imagine we are supposed to live our lives with constant aches and pains and a foggy-ness that clouds your entire being. The Fat Flush allows you to return your body to a normal natural position, free of the heaviness. Your liver will love you. It’s not overly restrictive. Last night’s dinner consisted of pan-seared scallops, baked salmon trimmings, 1 small baked potato, green beans and cucumber. It was yummy and I’m having the rest for lunch tomorrow. I’ve actually been doing the Fat Flush for over 5 years. Every once and a while I would spend two to four weeks eating really good and it always paid off. Unfortunately, when you have an insatiable sweet tooth and a busy life, it’s easy to fall off the flour/milk/sugar wagon. That, and all my friends and family just smile and say, yes…that’s tasty Heather; but stop asking me to contribute. My kids are all of 6 and 8 now and I keep reminding myself that their memories are all keepers. What happens matters, not subconsciously but in their permanent file. I’m taking a parenting class through our local children’s hospital Mental Health division and it’s helping me be the kind of parent I want my children to remember. None of it is rocket science, except for ignoring bad behaviour. You need a PhD in neurology to re-wire your brain not to react to constant pleading, begging and whining. We practiced at the drugstore. Justin asked for a toy while we were parking. I said, “Money is tight these days, so the answer is no tonight.” I try not to say no actually because thems are fightin’ words. But, tonight I meant it. No will-sees, maybes or if-you’re-goods. Just, plain, NO. He started begging. I ignored him. He threatened to not get out of the car unless I said yes. I ignored him. He pleaded his case over and over, I walked on. He stopped. I encouraged him to look at all the neat stuff in the store while I checked my blood pressure. He did. He started again. I ignored him. I needed food and chose a bag of bbq chips. He didn’t like that kind. I offered him any other kind on the shelf. He decided he wanted candy instead. He chose gummy candy. I said they were not ok. He chose chocolate. I said he had to share with his brother. He wanted a drink. I said one or the other. He stuck with the candy. We listened to every talking card on the rack. He picked out one for Father’s Day. We sat and waited for my prescription. He started again. I ignored him. He said, “You’re eating those chips and you didn’t even pay!” I ignored him. The Pharmacist snickered. We paid for everything and left. It would have been easier and cheaper to let him pick a toy from the dollar bin, but it’s the principle. I did it! We went to the store and his whining didn’t net him a toy that would be discarded in the backseat and, I didn’t lose my temper. Guess what? He still loves me and shared his candy with his brother. He better remember that…it was a tough night for me. It’s now 11:53 and I have until 12:00 to write, so I’ll get straight to the point. Tomorrow I promise I will get up when the alarm goes off at 5:45 and get ready to go to work. No diddle-daddle, just me, moving at the speed of “I mean it”. There’s a full day inside that inside office of mine, full of work that’s all started, yet far from complete and the office itself is far from decorated or tidy. In fact, it sickens me to sit there. I move from file to file, touching everything, completing nothing. It’s not how I prefer to work. I’m reminded of a saying that came from what was probably the first time management course ever to be labelled something other than common sense. The motto is: Touch each piece of paper only once. It was such a great idea that people would have it engraved on the back of the nameplate that sat on their desk, so the world could see who they were and they could see what they were supposed to do. I’m going to do this…tomorrow. Tonight I touched my taxes about 20 times. I could get busted for feeling up the government. This past year my life has been jammed with work and kids and other pleasant me-stuff. Taking on an interim new role at work was challenging, motivating and super confidence-building. But, my writing time suffered and I feel like a neophyte as I type this. To feel life within your heart, you need to hold the joy and pain, the laughter and tears. Without them you are empty and stuck. Each breath is a moment that crescendos to the peak of our existence. We don’t live to breathe, we breathe each moment to create a life worth living and it’s ours to experience without judgement from others. Accepting ourselves as we are frees us to become who we want to be. I have so much to share. So many learnings and lessons. Hurray moments and disappointments, but tonight I’ll just mention that my new kitty is growing balls. Enjoy ’em while you gottem’ Mel. After the kids lost their Nanny, they re-started asking for a kitten. I love cats, but not wet food nor kitty litter, so I clung to the excuse that we couldn’t have one with Mandy because there was no place to hide the food or the litter. But, over the past little while I started to soften and became a little attached to the idea myself. Early in April, I took a trip west to see a friend. I promised the boys when I got back we would think about getting a kitty. First phone call home, Justin asked if I had given it any more thought. I arrived home on Thursday and Saturday we found Caramel. The cutest little blonde. I call him Mel, goes better with Mandy. He’s relieving the top of my dishwater of papers and pens as I type this, oh and now clawing my back. I just love him and he and Mandy have bonded quickly. When Mandy gets yelled at, he runs to her side. When Mel falls off the window ledge, Mandy tries to pick him up. They even lick each other. I’m amazed. We didn’t try to keep them apart, just let them adjust. Mel has his own room, a basement closet, with a kitty door, where his food and debris are safe. However, cleaning out the closet started the perfect storm of spring cleaning. Justin and Korey decided they wanted separate rooms. Justin chose the playroom, which meant 8 years of toys needed removal. The whole thing went something like: first, clean up the toyspot in the rec-room (1 day). Then, go through the toys in the playroom and sort for keeper, garbage or yardsale (3 days). Then, move dressers, beds, bookshelves, lego tables and replant toys to rec-room (2 nights till 1:30 am). They are both very pleased with their own space and after a few timid moments last night and three books, Justin fell fast asleep in the bed my Daddy made me. Korey crawled in with me after his midnight trip to the washroom. Outside, the anti-garden is complete in the front. Last weekend, I tore out the overgrown mess of shrubs in the front of the house and bought 4 nice little Alberta spruce trees. I then graded the bed, layed down the fabric to stop the weeds, edged it with plastic edging and filled it in with peastone. The side of the house received the same treatment and next week, the entire perimetre of the backyard fence will look the same. I like it and it turns out I like gardening and landscaping. The hardest part was getting the staples out of the coil of edging and keeping Justin entertained. Seriously, in the span of 2 hours he drove his bike, got the mail twice, played basketball, helped me dig, didn’t help, watered everything, rollerbladed, bounced on the trampoline and told me story, after story, after story. I’m tracking a certain flight from western Canada tonight. Tomorrow is my reward. Breakfast in bed from the kids and then they are off with Dad a little bit earlier than usual. Korey and Justin lost their Nanny last week and I lost someone who, thinking back, was a great, generous gift to me. Brian called me on a Friday night to let me know she was gone. The kids were asleep by then and we decided to tell them together in the morning. Morning came, and with my secret bulging from my heart, I tried to keep them calm and relaxed, knowing what they were in for. Justin, for some reason, wanted to pull out all of the Hallowe’en stuff, especially this motion-sensored tombstone with hands that crawl up and down while exclaiming, “I’m not dead yet, let me out of here.” He said he wanted to scare Daddy. I encouraged him that it probably wasn’t the best day to do this. “Oh, because Nanny is sick and going to die?” he asked. I just nodded. The night before, at dinner, Justin said that Nanny had to go into this thing called a coma and she wasn’t going to wake up. Korey was defiant, “Yes she will, you stupid idiot. She’ll wake up again. What are you talking about?” And then he turned away, very angry at his little brother for suggesting such a thing. With his heart breaking, he asked me if that was true. I told him that she might not but she might, we don’t really know. She did actually wake up briefly just before she passed away. We sat them down Saturday morning and Brian explained what had happened. Justin started to cry immediately. Korey remained quiet and then said he wanted to get on the computer and asked if he could change his password to Nanny. That broke the floodgates and he sobbed uncontrollably for about 10 minutes. But, they both said they still wanted to go to the funeral, which we had talked about in preparing them. After assessing the clothes required for the service, I was on duty to get new shoes for Korey and a tie for Justin. He wasn’t sure if he wanted a bow tie or a long tie, nor did he really comprehend the difference. But, he felt a long tie would be better. “Just about down to here,” he said, motioning to his belly button. On Sunday night, I stopped in to see my nephew and his wife who were expecting a baby. She was so ready to deliver and with her due date on Tuesday, I wanted to see if I could help with a massage or some therapeutic touch. She had spent the day roaming the RV show trying to get things going and well, the combination worked. At midnight her water broke and she called me at 7:30 in the morning to say she was 4cm dilated. At 8:49 Nora was born. A healthy baby girl, one day early. I picked up the boys after work and we went to meet her. Justin decided to wear his new tie for Nora. He also chose one of his favourite toys to give her, a Sesame Street Fisher Price camper. In the hospital he said that he was sad that his Nanny died but the baby helped. During his bathroom time he explained that, “Laurie’s in the hospital but she’ll be going home, cause she isn’t sick. My Nanny was sick, but she didn’t get to go home.” I nodded that he was right. He then said to my sister, “Did you see my name in the news? Do you know why it was there? Cause my Nanny died. When you die they always put your name in the news.” He was talking about the obituary which Brian had cut out of the paper the day before. The day of the funeral, I got them all dressed up to go and their Dad picked them up. Little troopers. I didn’t sit with the family but from 4 rows back I could hear Korey sobbing and choking on his tears. It broke my heart. Afterward, Korey wanted to leave straight away. He was too upset to attend the reception. I loaded them into the car and asked if there was anything that would help. Lego was the medicine. They picked out some LegoRacers at the local drug store and we were on our way. I strapped Justin in and closed the door. As I walked around the back of the car, I could hear him screaming and looked to see his hand jammed solidly in the top of the door. He was ok though, nothing broken nor bruised. The boys changed their minds about going to the committal service with their Dad and we joined them later at the family gathering. Brian thanked me for being there, saying it would have meant a lot to his mother. She was devastated when we separated, worried so much about the kids and how they would fare. But Brian and I always put them first. We have a good relationship and the ability to work together to ensure they are safe and secure. Brian always tells them that even though we don’t live together, we are still a family and we take care of each other. I had the rest of the week off for March Break and Korey had a hockey tournament. We got an extra game on Thursday morning and he scored his very first goal— on defence, from the blueline. We watched the video last night and you can hear the coach yelling, “Put it in deep Korey.” And then you can see the puck going toward the net, but the camera didn’t actually catch the goal, nor Korey’s reaction. He said he fell as soon as he shot it. His teammates were all excited, “Korey scored. Way to go Korey. Great shot!” What a proud moment. His friend Josh also got his first goal in the same game. It is very true that any hockey is good hockey as long as it’s evenly matched. Watching these 7 year olds live or on video is just as exciting as an NHL game, in my opinion. After the game, we went to the canteen and there were lots of people sitting around waiting for games to begin. My BlackBerry pinged and I chose to respond to a message from work. The kids were running around. I told them to stop running. A few minutes later a gaggle of kids had joined them in their running game. I got up to tell them to stop and when I went to take a step, I tripped over my feet, or the chair or something and landed on my knees on the tile floor— the rest of me landing face first with my arms stretched out overhead. I could hear myself saying as I was going down, “I told you to stop running.” I’ll never forget the look on this little girl’s face before they all scurried off. My demon BlackBerry slid across the floor, almost going under a vending machine. I lay there in pain for a few seconds, unable to get up and then trying my best not to cry, I limped back to my seat, feigned the “f” word and resumed my message. I apologized to the parents sitting there (who didn’t even try to help me, by the way, mighty neighbourly) and held back my tears. The kids resumed their running elsewhere. I then wobbled outside full of pain and embarrassment. My sister had a good laugh when she got back to the canteen and the kids told her what happened. One guy who witnessed it couldn’t contain himself and laughed right along with them. That was the same day, in the middle of a happy moment, when Justin stopped short, turned to me and with a very perplexing look, said “You know Mommy when someone dies, it’s like it really didn’t happen. Like the person who told you was lying. But then you know it’s true.” I told him that was a very good way to explain it. I also told them that it is normal to cry when they think about their Nanny being gone, but as time passes, there will be less tears and more smiles when they remember her. My kids will never forget their Nanny. They loved her so much. “I still have two Nannies. One is in real life and one is in my heart,” says Justin. I think his Dad told him that. I’m learning a lot from my kids. I enjoy their honesty and let them talk, cry, get angry and just be quiet. Whatever they need at the moment. But one thing I won’t let them do is forget how important she was and how she’ll always be part of them. What a busy week. Today is my reward. I’m still in my jammies and it’s almost time for bed again. I think I deserve it and a trip away in a couple weeks to visit a friend. Last month I began massage therapy to fix up a whole bunch of problems probably related to my less than ergonomic desk set up. After two sessions, I took my receipts to our Medavie Bluecross Quick Pay office and was told that I needed to have a form completed by the therapist in order to submit my claim. “I will give you one form, but for any further claims the therapist will have to provide you with one. She’ll have to order them from us.” I thought the response was odd, but the person seemed cranky and I was on day 2 of not smoking, so I took the form and left, tail between my legs. My massage therapist completed the form on my next visit and back I went, this time with three receipts. I was greeted with the bad news that the form wasn’t completed properly because the benefit code for massage therapy wasn’t included. I asked if they knew it and was told there were different codes for different types of massage. The claims officer tried to reach my therapist, but, she was, as therapists usually are, probably therapying on someone else. So, I left again, tail between my legs and rightly frustrated. My therapist called me with the code and suggested the claims officers know the code and there’s no reason why they couldn’t have completed it. So, down I go again to the Quick Pay office and present them with the code. To which, the claims officer says, “I’ve never seen this code before.” And, she refused to pay me. Ok, I’m pissed off at this point, can you really blame me? She suggested I leave the claim with her and when she reaches my therapist she will call me or mail the cheque to me. I told her to call me when it is ready and I’ll pick it up. My therapist called again and said that the person she spoke with at Medavie Bluecross apologized and suggested the reason for the confusion was that there was a relatively new person on the case who didn’t know they could fill in the code. So, for the fourth time and 3rd time today, I returned to the office and very sternly asked for my money. The claims officer looked at me like she didn’t know what I was talking about. I gave her the correct code and then they all gathered to explain that it was my “plan” that was keeping them from paying me. My “plan” didn’t allow them to pay claims without the code. Then, the supervisor called me Ma’am. Never a good idea. No one apologized to me. The point is: The claims officers knew the code all along. All massage therapy is covered at the same percentage. They could have entered one for me, paid me and then followed up with my therapist to confirm. That would have been the client-centric thing to do. I was going to get my money in the end, why they made it so difficult for me just doesn’t make sense. And, if this pops up on your media monitoring Medavie Bluecross, do feel free to comment. I’d love to hear the response to this blatant lack of respect for my time and blood pressure. And, before you tell me that the “plan” is your client, remember, I pay premiums too and I had an extremely poor customer-service experience today in your Halifax office. You’ve got to do better than that. PS: I wrote the title of this post before I went to the Medavie Bluecross website and discovered their tagline. Spooky! Last year Korey got a taste of the pipes and has since wanted to be in there full time. We asked if we could register him as a goalie this year and were told not to; that the goalies would be chosen from those who expressed interest the following year. Stupid, earnest parents that we are, we didn’t. 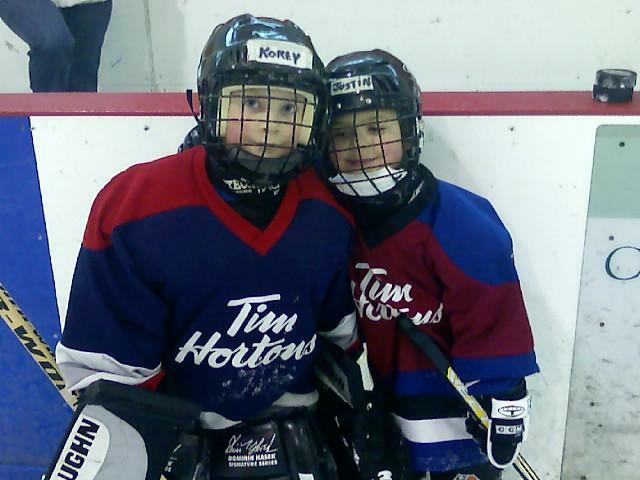 At the beginning of this season, there were a few kids dressed in goalie gear. I asked the parents how that happened and was told they just signed their kid up as a goalie. So, Korey’s been waiting all year, only getting a taste of the net every second Sunday, and never starting a game. Needless to say his enthusiasm was waning. “Why are both goalies wearing the same jerseys,” I asked my friend. “Because, that is YOUR son,” she responded. I thought he looked familiar. Apparently, the other team’s goalie didn’t show and there was gear available so Korey pinch hit in net. The gear was a complete season too big and it slowed him down a lot, but he only let in four shots from his own teammates and most were from their star player who has mastered the Gretzky wrap-around at the tender age of 7. “I tried to stay with him Mom, but I couldn’t get back quick enough,” he explained very matter-of-fact as if he were being interviewed by the CBC. I teared up, without embarrassment, at the end of the game when his adopted team crowded around him and made him their star. On the way home, we told him to either draw a picture or write down exactly how he felt on the date of this big event. He took his journal upstairs and when he came back he said he had written most of it. My request to read it received a flat “NO.” I haven’t, I really haven’t. I’m dying to, but I haven’t. Sunday at 7:00 am Korey was on the ice with this own, better fitting goalie gear and took practice with his and his adopted team who conveniently share the ice. But it didn’t end there. He then took practice with Justin’s team. You should have seen the look on those 5 year old faces when they walked in the dressing room and saw a real, live goalie dressed for them. Korey had a great time. Justin felt so special to have his “Biggie” on the ice with him and Korey was proud to help out his “Button”. It was a moment of brotherly love and affection. Next year we are registering him as a goalie. Korey’s hockey team won today, 4 zip. They were so excited and my Mom was in the audience, which made it that much sweeter. The last couple of weeks we’ve seen some big changes in their team. It’s so gratifying as a parent, and payer of the money, to watch them slow down until the puck goes over the blueline and actually shoot the puck against the boards on purpose to clear the zone. Korey played defence today and he made a few key plays, almost got a goal from his end. It was a proud moment. I feel like we are winning here too. After my first session with “the sanity angel” I was syked to begin taking charge. It didn’t go so well. Korey had a meltdown because I wouldn’t let him eat dinner in the living room, which resulted in his teeth marks on my leg. So out of character for him. I ended up yelling at him and he ate dinner at the table. No one won. But, I began again. This time with rewards for doing little things, like getting dressed on time in the morning without having to be asked repeatedly. It works! They love the rewards (coupons for small things, like 10 extra minutes on the computer). I’m also starting to ignore their bad behaviour and noticing their good behaviour. What a difference. I know, this seems like parenting 101, but so often we get caught up in what they are not doing, we forget to tell them they are awesome when they are. I guess since there are more than a dozen books on the subject, I’m not the only parent who needs to learn. Kind of would put the publisher out of business, you know. This weekend they accompanied me to my hair appointment. I’m sure my hairdresser cringes when she sees us coming. When I arrive solo, she always seems so happy. But, they didn’t make a sound the whole time I was there. Korey played Nintendo and Justin sat in the chair next to me and silently watched my hair fall to the floor. Every rule was followed. Rewards included a small, inexpensive toy. They were thrilled. Now, these rewards are achieved in levels, I’m not stupid. Once they master doing something well, then they move on to another activity, just like a video game. They came upstairs for bed the minute I called them last night and once settled Justin said they should get a reward for coming so quickly. I gave him a big hug and kiss and told him sometimes rewards are hugs and kisses. He beemed and said they were good rewards too. My reward, a great weekend with the kids and on our way home this morning from hockey practice they said they wanted to come to my house instead of Dad’s. They went to Dad’s any way, but the mere fact that they wanted to come here made me beam.